If you missed us last Tuesday Feb 28, there will be repeat telecasts of our feature on Green Living. Watch ANC on the following times to see more about The Big Switch and other spiels about climate change. “Darna at ang Nawawalang Bato” the card game is a milestone for us here at Balangay Entertainment. It may be a simple game but would it surprise you to hear that it’s been years in the making? We were frustrated to be hush-hush for so long but because we were a licensee, we had to keep quiet. If you ever wondered how the game came to be, here’s Part 1 of the untold story of “Darna at ang Nawawalang Bato”. Games about Filipino Pop Culture. About the third goal: If abroad, franchises like Game of Thrones, Harry Potter, Lord of the Rings, etc could migrate from medium to medium (like how Harry Potter started as a book then became a series of movies, then games, then etc), why couldn’t our own popular culture do the same? We wanted to be the ones who would bring our popular culture to tabletop games. In 2014, we started working full-time in Balangay while designing the educational game Resilience: Survive and Thrive. Around that time, there were rumors of a Darna reboot with Angel Locsin. If we wanted to bring our pop culture to tabletop games, who better to start with than Darna! This was the perfect opportunity for the pop culture icon to make the jump to tabletop. Very early on, we already knew what the hook and the core experience of the game would be: transforming by shouting Darna! First appearing in Mars Ravelo’s komiks, Darna’s been in movies, teleseryes, and even other local komiks. Her look, her stories, and her powers have changed from adaptation to adaptation. The one thing that’s remained consistent and iconic about her is her transformation: swallowing the Puting Bato and shouting DARNA! From the very beginning, we wanted that to be the foundation of the game. Around this time, I came across deckbuilding through games like Ascension and Legendary. (I still remember trying to buy Dominion from Gaming Library back in 2014 when they were still a small operation but it kept getting holed up in customs so I traded the order for Legendary instead.) 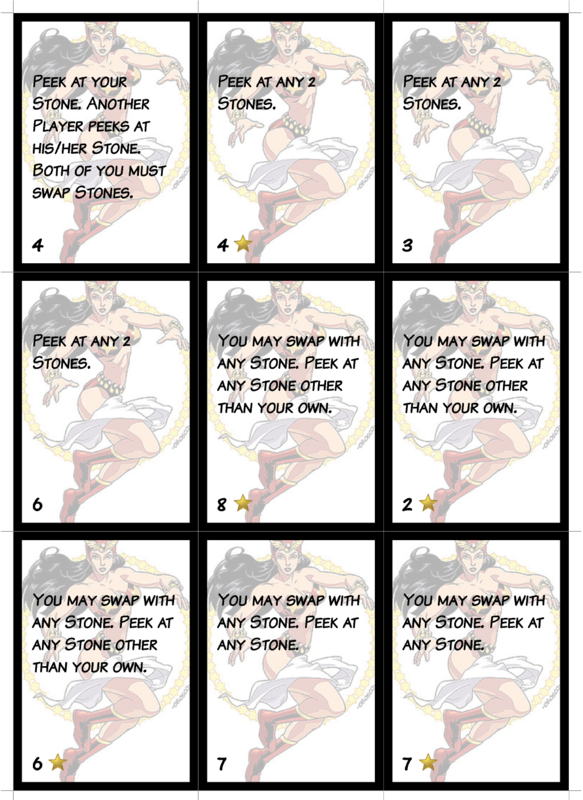 Excited with the new format, I designed the Darna Deckbuilder. In the game, players build their decks by buying cards through a central market much like in Ascension. Each card either has the letters D, A, R, or N on them. The ultimate goal is for you to have the cards spell D-A-R-N-A in your hand and to shout DARNA! The cards also have abilities to help thin, draw, and filter through your deck to help setup your draw for the win. Villain cards also pop out in the market every once in awhile to mess up every player’s hands and make the game more difficult. Production on Resilience: Survive and Thrive put development on the Darna Deckbuilder on hold. We also knew we needed a license to even consider bringing the game to market so we shelved the game. While the Darna Deckbuilder was on ice, we worked on Resilience, The Big Switch, Trese Case Files, and many others. Suddenly in early 2016 (if i remember right), we were able to set a meeting with ABS-CBN! At this time there were already rumors that Angel would not be able to play the part because of her set injuries. Though the future of an adaptation was uncertain, we still wanted to push through with the game. 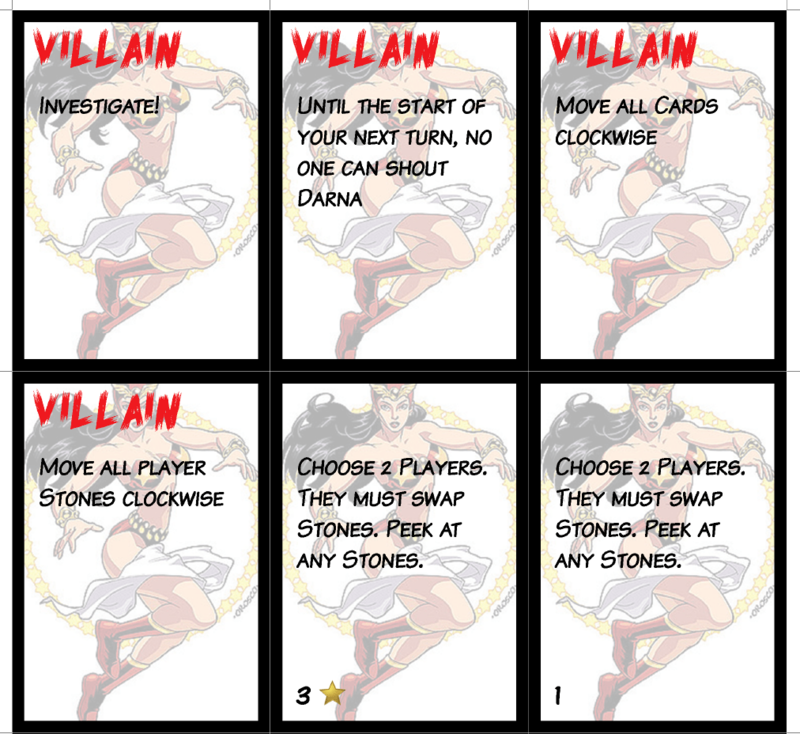 We unfroze what we had from the Darna Deckbuilder and quickly made a presentable mock-up. The game was too complicated. Unfortunately, tabletop gaming is still very niche in the country and not everyone has an easy time understanding a concept like deckbuilding. We already had that suspicion due to our experiences with Resilience and The Big Switch. The game would be too expensive for our target audience because deckbuilders needed a lot of cards. We left that office with a better understanding of what we needed to make to really bring Darna into tabletop games. What we were doing still interested ABS-CBN so they told us to contact them once we had a more apt design. Easy-to-learn and easy-to-teach. A lot of people outside the hobby have a low threshold for learning new rules so it had to be teachable in 5 minutes tops. Also, anyone should be able to teach it easily. Quick. The shorter the game, the less intimidating it is for the uninitiated to agree to try it. Strategic enough to give a taste of the hobby. We definitely weren’t making the next Agricola but the game had to have enough meat in it to make people curious about modern board games. Fun and deep enough to tickle the enthusiasts. It’s hard to make a game for both newbies and enthusiasts. If you make it too deep, the game will intimidate newbies; too shallow and you’ll bore enthusiasts. Though we wanted it to be simple enough to be gateway, we still wanted it deep enough so that we wouldn’t be embarrassed to show it to fellow enthusiasts. The game had to make a statement: Filipinos can actually design tabletop games. Ours is a fledgeling industry with a damaged reputation from years of other local publishers not really understanding game design and modern games, and just making local versions of Scrabble, Monopoly, Chess, Snakes and Ladders, etc. We needed to draw the line here that Filipinos can design original games with value more than the paper it was printed on. Marx wanted to take over because he had some ideas to try out so I gave the project over to him. To make it cheap, Marx wanted to turn the game into a microgame to lower production costs. He let the idea simmer while we worked on Trese Case Files and researched different microgames. Though we’d been playing The Resistance and Love Letter for years, the new design restrictions made him look into other small games like Lost Legacy and Masquerade. Shouting Darna at the start of your turn to win if you have the Puting Bato. Draw one card then play one card during your turn if you don’t shout. There were a lot of differences too like if you shouted Darna and were wrong, you’d get eliminated from the game. Also, the player cards you played were Darna and her allies since they helped you get the Puting Bato, unlike now where you can play villains like Valentina and Armida. Back then, the villains had a different role in the game. At this stage, the design also had Villain cards that triggered as soon as someone drew them on their turn. When a player draws a Villain, they had to instantly read aloud an effect that would mess-up the game for all the players. The Villain cards sowed chaos without discrimination; exactly what Villains do. Villain events were thematic but complicated remnants from the Deckbuilder game. The Villain cards with 2 other Player cards from our prototype print sheet. Originally, the game didn’t end until someone won by shouting Darna. When the deck ran out and no one had won yet, everyone lost. We knew it was anticlimactic but it was a tentative ending to the game until we could find something better. After playing Lost Legacy with Marx, we adopted a sudden death guessing of the Puting Bato to make the game short and sweet. Originally, the guessing stage starts when a player draws a special Villain event. (Inspired by Lost Legacy, the placeholder card read “Investigate!” as seen in the image above.) When a player drew that particular villain card, the game immediately went to the guessing stage. The randomness meant people couldn’t foresee when the game would end. We set up a meeting and demoed the game again to ABS-CBN. They were happy with the improvements and thought we had something that could work. It was still a little too complicated and unrefined, especially because of the Villain cards. There were still no layouts, icons, art, etc. However, it was a starting point where they recognized the potential. It was here that they initiated talks with us about the license. In hindsight, I don’t know why we didn’t go wild with the realization that it was seriously happening. We were probably just focused on getting the game done in time.